Lyme Connection Chair Karen Gaudian welcoming participants to the beautiful Leir Retreat Center in Ridgefield (CT) for the October 2017 conference. 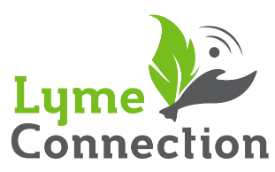 Lyme Connection is especially proud of the relationship we have fostered with medical and mental health practitioners, researchers, health directors, health educators and ancillary professionals. We are always looking for opportunities to build on the body of knowledge that improves illness prevention, diagnosis and patient care. Our professional conferences are supported by the Leir Retreat Center. Second professional conference for naturopaths and alternative practitioners interested in treating tickborne disease patients held at the Leir Retreat Center in Ridgefield, CT.
Sixth professional conference for mental health practitioners held at the Leir Retreat Center in Ridgefield, CT. Topics included mechanisms of brain involvement, infection-induced autoimmune encephalopathy, the role of psychoimmunology, symptom presentation, and diagnostic and treatment considerations. 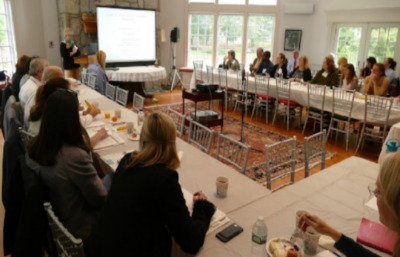 Fifth professional conference for mental health practitioners held at the Leir Retreat Center in Ridgefield, CT.
Fourth professional conference for mental health practitioners held at the Leir Retreat Center in Ridgefield, CT.
Third professional conference for mental health professionals. Program offered a comprehensive look at the role infection plays in children with mental health and learning diagnoses. Held at Leir Retreat Center, Ridgefield, CT.
Professional conference for naturopaths and alternative practitioners interested in treating Lyme disease patients held at the Leir Retreat Center in Ridgefield, CT.
Second tickborne disease prevention event for health directors and health educators held at the Leir Retreat Center in Ridgefield, CT. Symposium for Fairfield County health directors and health educators introducing the BLAST Tickborne Disease Prevention Program. Held at the Leir Retreat Center in Ridgefield, CT.